Trench warfare is a form of land warfare using occupied fighting lines consisting largely of trenches, in which troops are significantly protected from the enemy's small arms fire and are substantially sheltered from artillery. The most prominent case of trench warfare is the Western Front in World War I. It has become a byword for stalemate, attrition and futility in conflict. Trench warfare occurred when a revolution in firepower was not matched by similar advances in mobility, resulting in a grueling form of warfare in which the defender held the advantage. 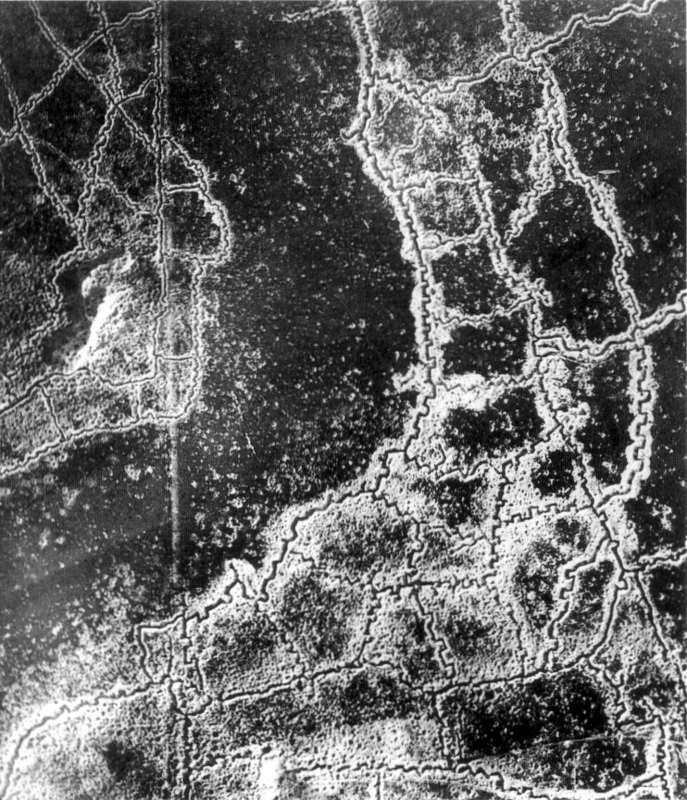 In World War I, both sides constructed elaborate trench and dugout systems opposing each other along a front, protected from assault by barbed wire. The area between opposing trench lines (known as "no man's land") was fully exposed to artillery fire from both sides. Attacks, even if successful, often sustained severe casualties as a matter of course. The Lines of Stollhofen were built by members of the Grand Alliance at the start of the War of the Spanish Succession running for about 10 miles (16 km) from Stollhofen on the Rhine to the impenetrable woods on the hills east of Bühl. They played a pivotal role in manoeuvring that took place before the Battle of Blenheim (1704). 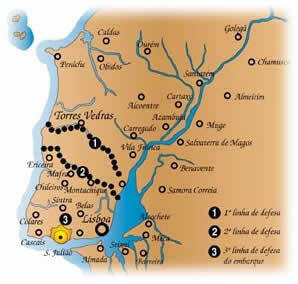 The lines were captured by the French in 1707 and demolished. Field works were later employed on an even larger scale in the American Civil War (most notably in the sieges of Petersburg and Vicksburg), the Paraguayan War, the Second Anglo-Boer War, and the Russo-Japanese War. 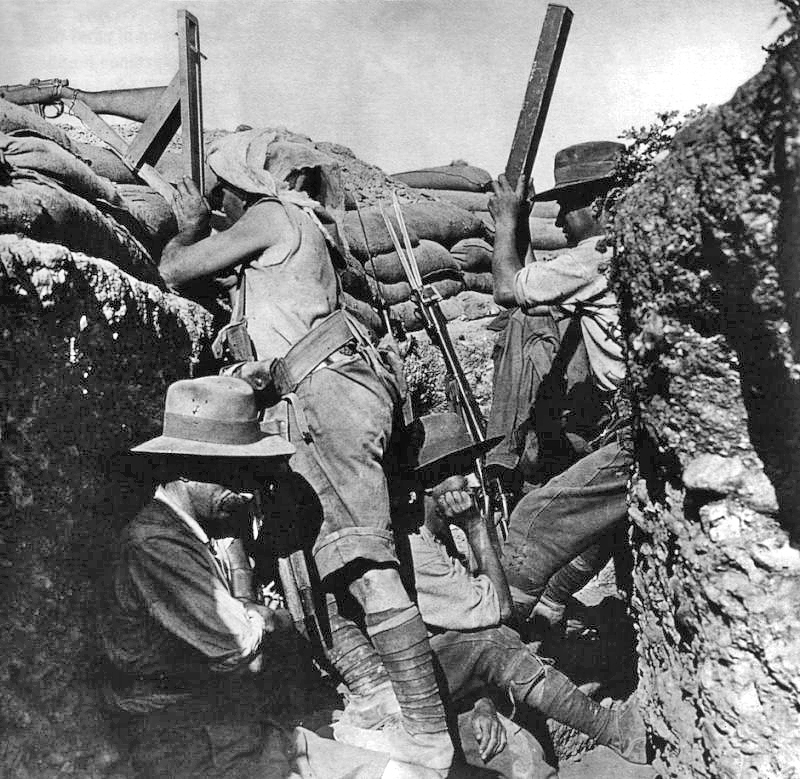 Fundamentally, as the range and rate of fire of rifled small arms increased, a defender shielded from enemy fire (in a trench, house window, behind a large rock, or behind other cover) was often able to kill several approaching foes before they closed with his position. This was only made more lethal by the introduction of rapid-firing artillery, exemplified by the "French 75", and high explosive fragmentation rounds. The increases in firepower had outstripped the ability of infantry (or even cavalry) to cover the ground between firing lines, and the ability of armour to withstand fire. It would take a revolution in mobility to change that. Rats, lice, diseases, and death were all the most common companion in this world. 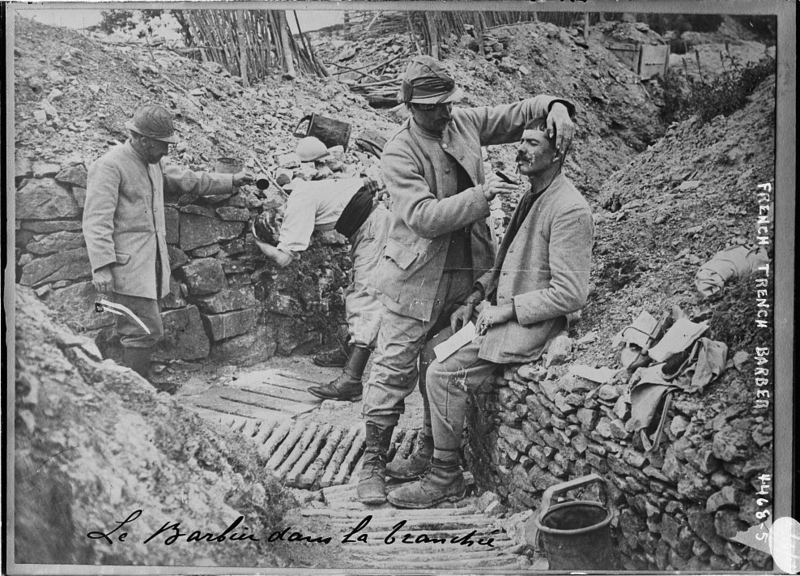 Trench warfare has become a powerful symbol of the futility of war. Its image is of young men going "over the top" (over the parapet of the trench, to attack the enemy trench line) into a maelstrom of fire leading to near-certain death, typified by the first day of the Somme (on which the British suffered 57,000 casualties) or the grinding slaughter in the mud of Passchendaele. 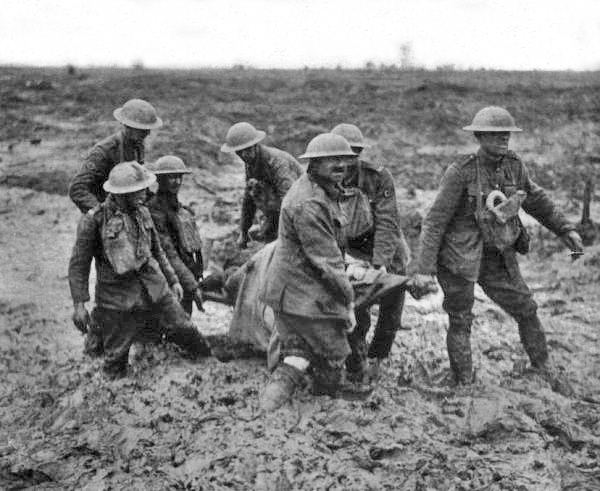 To the French, the equivalent is the attrition of the Battle of Verdun in which they suffered 380,000 casualties. In fact the picture is far more complex. It is easy to find examples of backward and inflexible generals early in World War I. There were failures such as Passchendaele, and Sir Douglas Haig is criticised for allowing his battles to continue long after they had lost any purpose other than attrition. Trench raiding and patrolling led to high casualties. There was an emphasis on seeking breakthroughs, rather than being content with "bite and hold" battles. Yet there were also tactical and technical innovations. 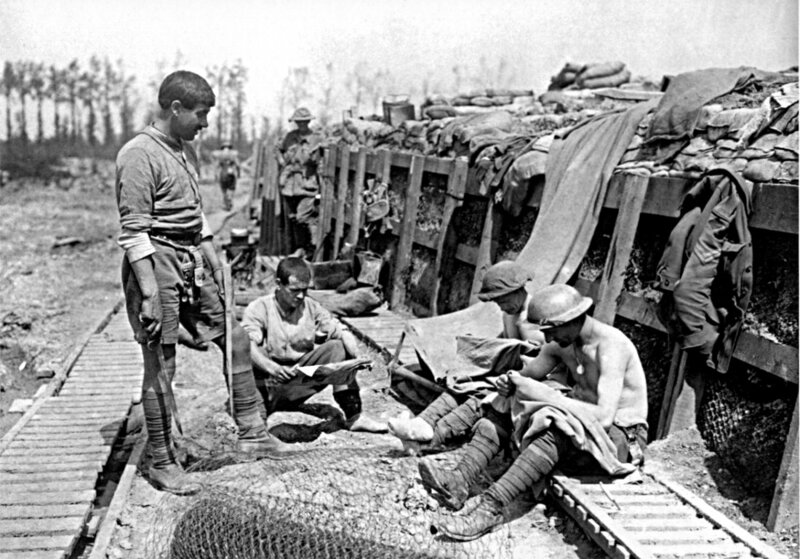 The problems of trench warfare were recognised, and attempts were made to address them. Solutions included improvements in artillery, better infantry tactics and the development of tanks. The lessons of the first day of the Somme were learned very quickly, and by 1918 attacks were generally more successful and suffered fewer casualties; in the hundred days there was even a return to mobile warfare. The Allies eventually achieved a decisive victory. Although technology had drastically changed the nature of warfare by 1914, the armies of the major combatants had not correctly anticipated the implications. The French and German armies adopted dramatically different tactical doctrines. The French relied on the attack with speed and surprise. The Germans relied on firepower, investing heavily in howitzers and machine guns. The British lacked a coherent tactical doctrine, with an officer corps that rejected theory in favour of pragmatism. Early trenches were simple. They lacked traverses, and according to pre-war doctrine were to be packed with men fighting shoulder to shoulder, leading to heavy casualties from artillery fire. This, and the length of the front to be defended, soon led to front line trenches being held by fewer men. In addition to the trenches themselves, barbed wire was strung up to impede movement, and wiring parties went out every night to improve these forward defences. The small, improvised trenches of the first few months grew deeper and more complex, gradually becoming vast areas of interlocking defensive works. They resisted both artillery bombardments and mass infantry assaults. Shell-proof dugouts became a high priority. The space between the opposing trenches was referred to as no man's land and varied in width depending on the battlefield. On the Western Front it was typically between 100 and 300 yards (90 and 275 m), though only 30 yards (27 m) on Vimy Ridge. In the Alps, trench warfare even stretched onto vertical slopes and deep into the mountains, to heights of 3,900 m (12,800 ft) above sea level. The Ortler had an artillery position on its summit near the front line. The trench-line management and trench profiles had to be adapted to the rough terrain, hard rock, and harsh weather conditions. Many trench systems were constructed within glaciers like the Adamello-Presanella group or the famous city below the ice on the Marmolada in the Dolomites. 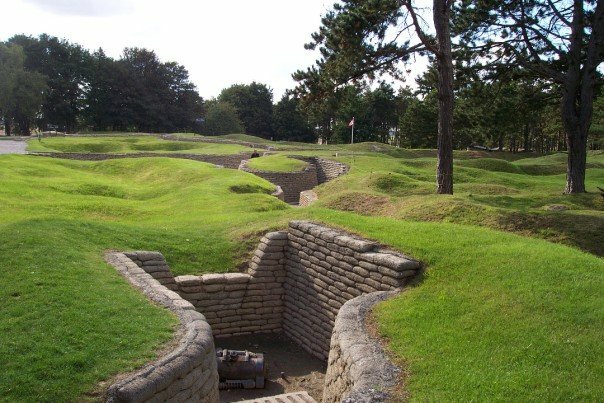 Between 100 and 300 yards (90 and 275 m) further to the rear was located the third reserve trench, where the reserve troops could amass for a counter-attack if the front trenches were captured. This defensive layout was soon rendered obsolete as the power of artillery grew; however, in certain sectors of the front, the support trench was maintained as a decoy to attract the enemy bombardment away from the front and reserve lines. Fires were lit in the support line to make it appear inhabited and any damage done immediately repaired. The Germans, who had based their knowledge on studies of the Russo-Japanese War, made something of a science out of designing and constructing defensive works. They used reinforced concrete to construct deep, shell-proof, ventilated dugouts, as well as strategic strongpoints. They were more willing than their opponents to make a strategic withdrawal to a superior prepared defensive position. They were also the first to apply the concept of "defence in depth", where the front-line zone was hundreds of yards deep and contained a series of redoubts rather than a continuous trench. Each redoubt could provide supporting fire to its neighbours, and while the attackers had freedom of movement between the redoubts, they would be subjected to withering enfilade fire. The confined, static, and subterranean nature of trench warfare resulted in it developing its own peculiar form of geography. In the forward zone, the conventional transport infrastructure of roads and rail were replaced by the network of trenches and light tramways. The critical advantage that could be gained by holding the high ground meant that minor hills and ridges gained enormous significance. Many slight hills and valleys were so subtle as to have been nameless until the front line encroached upon them. Some hills were named for their height in metres, such as Hill 60. A farmhouse, windmill, quarry, or copse of trees would become the focus of a determined struggle simply because it was the largest identifiable feature. However, it would not take the artillery long to obliterate it, so that thereafter it became just a name on a map. According to the semi-biographical War-Novel All Quiet on the Western Front, many soldiers preferred to use a sharpened spade as an improvised melee weapon instead of the bayonet, as the bayonet tended to get "stuck" in stabbed opponents, rendering it useless in heated battle. The shorter length also made them easier to use in the confined quarters of the trenches. These tools could then be used to dig in after they had taken a trench. Since the troops were often not adequately equipped for trench warfare, improvised weapons were common in the first encounters, such as short wooden clubs and metal maces, as well as trench knives and brass knuckles. As the war progressed, better equipment was issued, and improvised arms were discarded. The hand grenade came to be one of the primary infantry weapon of trench warfare. Both sides were quick to raise specialist grenadier groups. The grenade enabled a soldier to engage the enemy without exposing himself to fire, and it did not require precise accuracy to kill or maim. Another benefit was that if a soldier could get close enough to the trenches, enemies hiding in trenches could be attacked. The Germans and Turks were well equipped with grenades from the start of the war, but the British, who had ceased using grenadiers in the 1870s and did not anticipate a siege war, entered the conflict with virtually none, so soldiers had to improvise bombs with whatever was available (see Jam Tin Grenade). 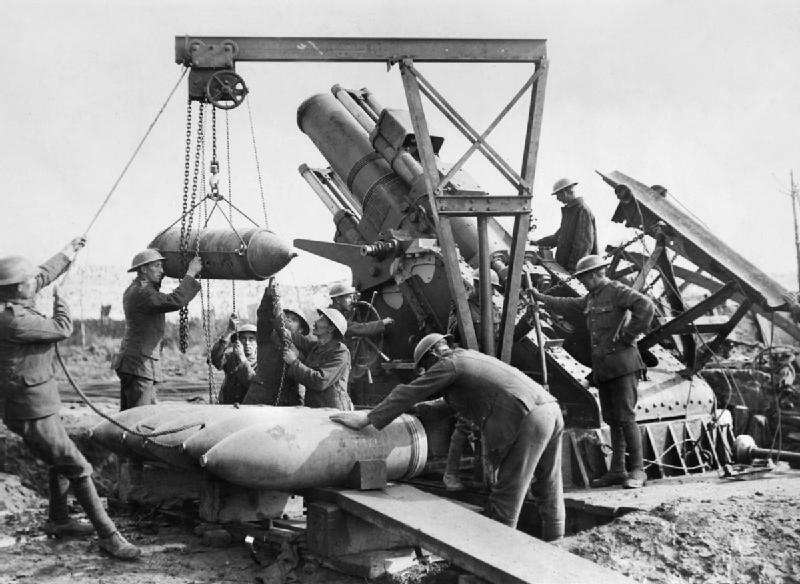 By late 1915, the British Mills bomb had entered wide circulation, and by the end of the war 75 million had been used. Mortars, which lobbed a shell in a high arc over a relatively short distance, were widely used in trench fighting for harassing the forward trenches, for cutting wire in preparation for a raid or attack, and for destroying dugouts, saps and other entrenchments. In 1914, the British fired a total of 545 mortar shells; in 1916, they fired over 6,500,000. Similarly, howitzers, which fire on a more direct arc than mortars, raised in number from over 1,000 shells in 1914, to over 4,500,000 in 1916. The smaller numerical difference in mortar rounds, as opposed to howitzer rounds, is presumed[by whom?] to be related to the expanded costs of manufacturing the larger and more resource intensive howitzer rounds. The role of artillery in an infantry attack was twofold. The first aim of a bombardment was to prepare the ground for an infantry assault, killing or demoralising the enemy garrison and destroying his defences. The duration of these initial bombardments varied, from seconds to days. The problem with artillery bombardments prior to infantry assaults was that they were often ineffective at destroying enemy defences and only served to provide the enemy with advance notice that an attack was imminent. The British bombardment that began the Battle of the Somme lasted eight days but did little damage to either the German barbed wire or their deep dug-outs where the defenders were able to wait out the bombardment in relative safety. 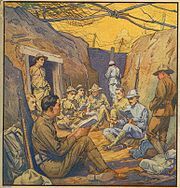 Throughout World War I, the major combatants slowly groped their way towards the tactics necessary for breaking the stalemate of trench warfare, beginning with the French and Germans, with the British Empire forces also contributing to the collective learning experience. The Germans were able to reinforce their western front with additional troops from the east once Russia dropped out of the war in 1917. This allowed them to take units out of the line and train them in new methods and tactics, such as stormtroopers. Conceived to provide protection from fire, tanks added mobility as well. As the Allied forces perfected them, they broke the stalemate. While not effectively employed at first, tanks had tremendous effects on the morale of German troops in the closing stages of the war on the Western front. The average infantryman had no anti-tank capability, and there were no specialised anti-tank guns. Once tanks began to be used in concentrations, they relatively easily broke through German lines and could not be dislodged through infantry counterattack. During the last 100 days of World War I, the Allied forces broke through the German trench system and harried the Germans back using infantry supported by tanks and close air support. Between the two world wars these techniques and innovations were developed and described worldwide by people like B.H. Liddell Hart, J. Walter Christie, Charles de Gaulle, Cavalcanti de Albuquerque and Russian military theorists, among others, to improve this new type of warfare. The ideas were picked up by the Germans, who developed them further and put them into practice as blitzkrieg much later during World War II. The stunning victories by the Germans early in World War II showed that fixed fortifications like the Maginot Line were worthless if there was room to circumvent them. At the Battle of Sevastopol, Red Army forces successfully held trench systems on the narrow peninsula for several months against intense German bombardment. The Western Allies in 1944 broke through the incomplete Atlantic Wall with relative ease through a combination of amphibious landings, naval gunfire, air attack, and airborne landings. Combined arms tactics where infantry, artillery, armour and aircraft cooperate closely greatly reduced the importance of trench warfare. In the Pacific Theatre, during World War II, the Japanese used a labyrinth of underground fixed positions to slow down the Allied advances on many Pacific Islands. The Japanese built fixed fortifications on Iwo Jima, Okinawa, and Guadalcanal using a system of underground tunnels to interconnect their fortified positions. The Japanese had on Battle of Iwo Jima several levels of honeycombed fortifications. The Japanese caused the American advance to slow down and caused massive casualties with these underground fixed positions. The Americans had to use flamethrowers to clear them out, as well as systematic hand to hand fighting. 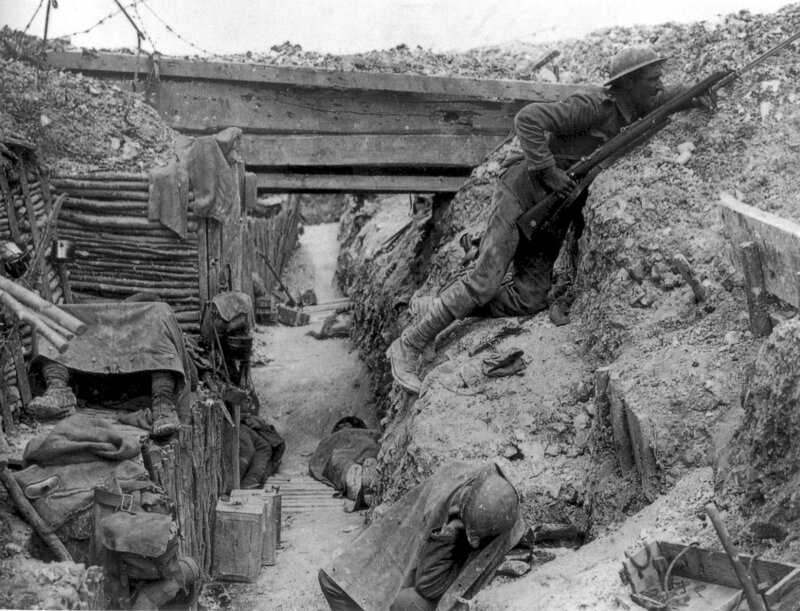 Trench warfare has been infrequent since the end of World War I. When two large armoured armies meet, the result has generally been mobile warfare of the type which developed in World War II. However, trench warfare reemerged in the latter stages of the Chinese Civil War (Huaihai Campaign), the Korean War (from July 1951 to its end), and in some locations and engagements during the Vietnam War. During the Cold War, NATO forces routinely trained to fight through extensive works called "Soviet-style trench systems", named after the Warsaw Pact's complex systems of field fortifications, an extension of Soviet field entrenching practices for which they were famous in their Great Patriotic War. 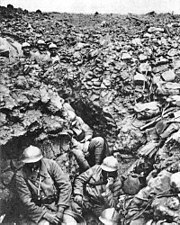 Another example of trench warfare after World War I was the Iran–Iraq War, in which both armies had a large number of infantry with modern small arms, but very little armour, aircraft, or training in combined operations. Tactics used included trench warfare, machine gun posts, bayonet charges, use of barbed wire across trenches and on no-man's land, human wave attacks and Iraq's extensive use of chemical weapons such as mustard gas against Iranian troops. Although mainly a siege, it was not unusual to find an extensive trench system inside and outside the city of Sarajevo during the siege of 1992–1996. It was used mainly for transportation to the frontline or to avoid snipers inside the city. Any pre-existing structures were used as trenches, the best known example is the bobsleigh course on Trebević, which was used by both Serb and Bosniak during the siege. Another example of trench stalemate was the Eritrean-Ethiopian War of 1998–2000. The front line in Korea and the front lines between Pakistan and India in Kashmir are two examples of demarcation lines which could become hot at any time. They consist of kilometres of trenches linking fortified strongpoints and in Korea surrounded by millions of land mines. ↑ "Dictionary.com Cultural Dictionary". http://dictionary.reference.com/browse/trench%20warfare. Retrieved 14 August 2009. ↑ Nolan, Cathal J. (2008). "Wars of the Age of Louis XIV, 1650-1715". ABC-CLIO. p. 253. ISBN 9780313359200. ↑ Cowen, James (1955). "Chapter 7: The Attack on Ohaeawai". The New Zealand Wars: A History of the Maori Campaigns and the Pioneering Period (1845–64). Volume I. Wellington: R.E. Owen, Government Printer. http://www.nzetc.org/tm/scholarly/tei-Cow01NewZ-c7.html. ↑ "Early Maori military engineering skills to be honoured by New Zealand Professional Engineers". New Zealand Department of Conservation. 14 February 2008. http://www.doc.govt.nz/about-doc/news/media-releases/2008/early-maori-military-engineering-skills-to-be-honoured-by-new-zealand-professional-engineers/. ↑ Graham, James. "The Battle for Kawiti's Ohaeawai Pa". HistoryOrb.com. http://www.historyorb.com/nz/ohaeawai.shtml. Retrieved 26 September 2010. ↑ Edgerton, Robert B. Warriors of the Rising Sun (New York: W. W. Norton, 1997); Coox, Alvin D., & Hayashi, Saburo. Kogun (Quantico: Marine Corps Association, 1959). ↑ 27.0 27.1 Canada's Army, p.79. ↑ 31.0 31.1 31.2 Canada's Army, p.82. ↑ Gary Sheffield (2007). War on the Western Front: In the Trenches of World War I. Osprey Publishing. p. 201. ISBN 1846032105. ↑ Hugh Chisholm (1922). The Encyclopædia Britannica: The New Volumes, Constituting, in Combination with the Twenty-nine Volumes of the Eleventh Edition, the Twelfth Edition of that Work, and Also Supplying a New, Distinctive, and Independent Library of Reference Dealing with Events and Developments of the Period 1910 to 1921 Inclusive, Volume 1. Encyclopædia Britannica Company Limited. p. 470. ↑ Jordan, Jonathan W. (November 1, 2002). "Weaponry: Hiram Maxim's machine gun probably claimed more lives than any other weapon ever made". p. 16. ↑ John K. Mahon and Romana Danysh (1972). INFANTRY Part I: Regular Army. ARMY LINEAGE SERIES. United States Army Center of Military History. LOC number: 74-610219. http://www.history.army.mil/books/Lineage/in/infantry.htm. ↑ Saturday, 22 August 2009 Michael Duffy (2009-08-22). "Weapons of War: Machine Guns". First World War.com. http://www.firstworldwar.com/weaponry/machineguns.htm. Retrieved 2013-05-23. ↑ "Bangalore torpedo", in Fitzsimons, Bernard, editor, Encyclopedia of 20h Century Weapons and Warfare (London: Phoebus Publishing Company 1977), Volume 3, p.269. ↑ 42.0 42.1 "Battles: The Battle of Messines, 1917". http://www.firstworldwar.com/battles/messines.htm. Retrieved 2008-04-19. ↑ Dagne 2000, p. 12. Dagne, Theodros (6 July 2000). "The Ethiopia-Eritrea conflict (CRS report number: RL30598)". Foreign Affairs and National Defense Division, United States Congressional Research Service. p. 12. http://wlstorage.net/file/crs/RL30598.pdf. Griffith, Paddy (1996). Battle Tactics of the Western Front – The British Army's Art of Attack 1916–18. Yale University Press. ISBN 0-300-06663-5. Griffith, Paddy (2004). Fortifications of the Western Front 1914–18. Osprey. ISBN 978-1-84176-760-4. 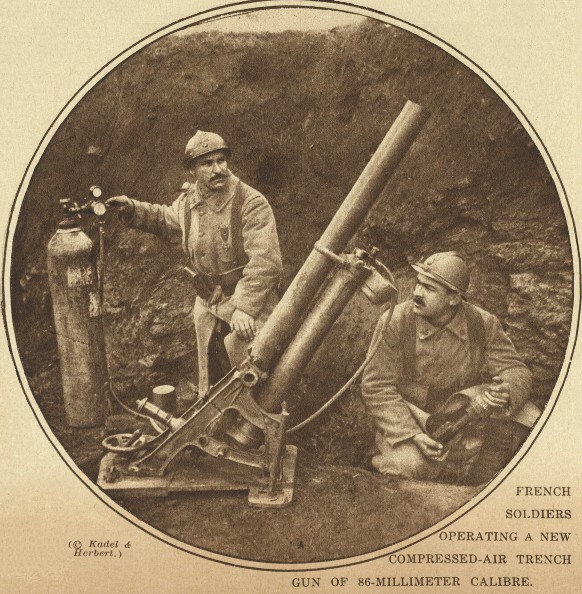 Wikimedia Commons has media related to Trench warfare.